getcalc.com's fuel or water tank capacity calculator is an online basic geometry tool & formulas to measure the capacity of cylindrical or rectangular tank, in US customary & metric (SI) units (Gallons & Liters). Tank Capacity is a measure of how much maximum Gallons or Liters of fuel or water a cylindrical or rectangular tank can contain, based on its volume space. 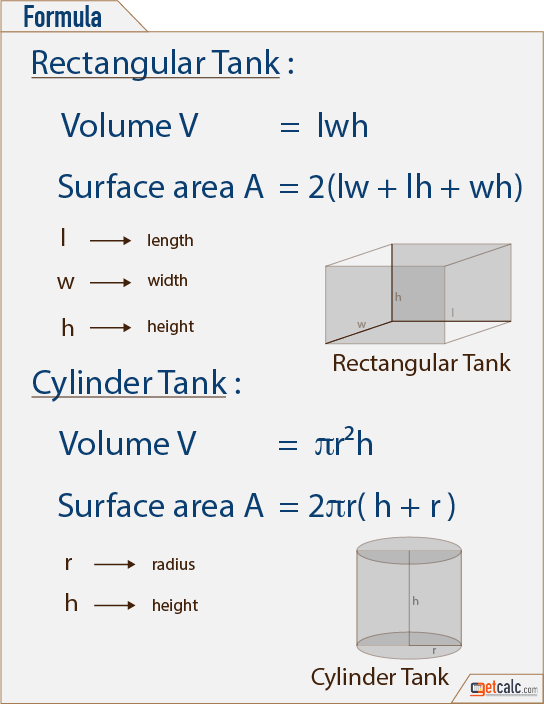 K-12 students may refer the below formulas of rectangular or cylinderical tank to know what are all the input parameters are being used to find how much gallons or liters of liquid a tank can hold. Below are the practice problems for grade school students, on finding what is the capacity of rectangular or cylinderical tank. By click on the corresponding problem shows the step-by-step calculation or work with steps for how to find such values of tank capacity mathematically. For any other similar values, use this polygon calculator to verify the results. Find what is the capacity of rectangular tank whose length is 45 inches, width is 32 inches and the height is 76 inches? How many liters of water a rectangular tank can hold, if it has the length of 150 cm, width of 100 cm and height of 200 cm? How many gallons of liquid a cylindrical tank can hold, if it has the radius of 180 inches and the height of 500 inches? Find what is the capacity of cylindrical tank whose radius is 120 centimeters and the height is 300 centimeters?